57db2b54 – Enable more warnings and fix them. 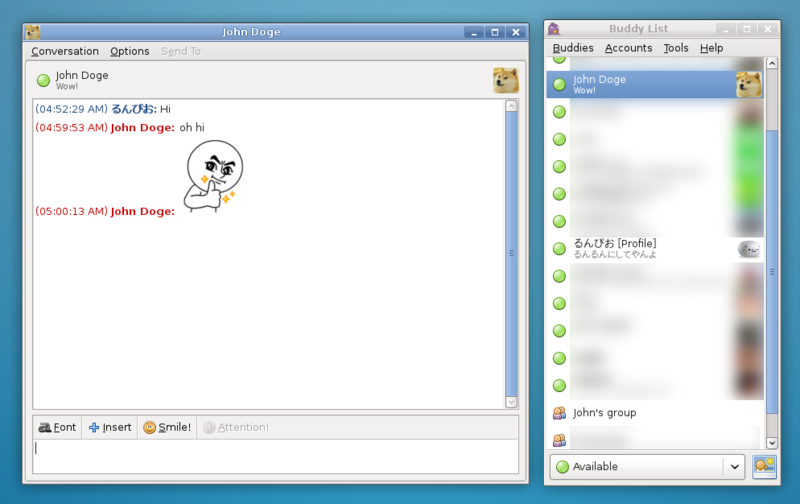 libpurple (Pidgin, Finch) protocol plugin for LINE. An APT repository is available for installing the plugin. The repository contains the purple-line package itself, and the required Apache Thrift packages which are not properly packaged by either distribution. The mirror is also available via SSL for secure access by using a https:// url. For instructions for adding a custom repository on Ubuntu, see the Ubuntu wiki. Note that apt-build is not an official APT family program. If you install via source, your purple-line version will be up to date with the git repository. Note that the current git version may not have been tested on Ubuntu/Debian. The package will install known build dependencies, but if the git version requires new dependencies, compilation will fail. libpurple - Library that provides the core functionality of Pidgin and other compatible clients. Probably available from your package manager. thrift - Apache Thrift compiler. May be available from your package manager. libthrift - Apache Thrift C++ library. May be available from your package manager. libgcrypt - Crypto library. Probably available from your package manager. The makefile supports a flag THRIFT_STATIC=true which causes it to download and build a version of Thrift and statically link it. This should be convenient for people using one of the numerous distributions that do not package Thrift. You can also install the plugin for your user only by replacing install with user-install. Pre-built binaries for Windows are available at Eion Robb’s website. If you want to use purple-line with Pidgin or Finch, copy libline.dll into C:\Program Files (x86)\Pidgin\plugins\ and libgcrypt-20.dll & libgpg-error-0.dll into C:\Program Files (x86)\Pidgin\. Audio/Video (send) File transfer API for sending?